Experience the Isle of Man TT like never before, with the best quality on-bike footage ever recorded around the legendary 37.73-mile Mountain course. For two weeks every year public roads become the world’s most famous racetrack and the bravest and most skilled riders put their courage and abilities to the ultimate test. 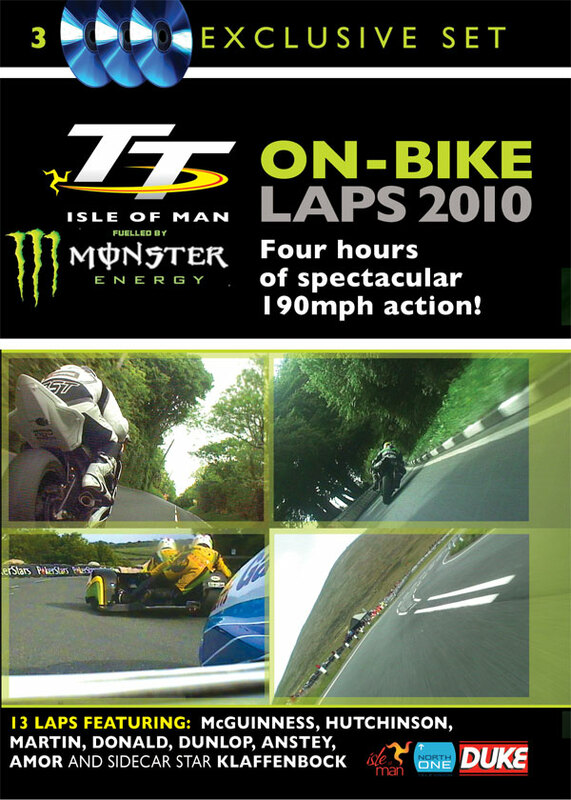 Now you can join the stars for 13 complete laps recorded from on-board the racing machines during the 2010 TT. It is a white-knuckle thrill-ride and you will be leaping back from the screen as walls, hedges and houses flash past, just inches from the camera, at speeds approaching 200mph. A rear-facing camera on Keith Amor’s HM Plant Honda Superbike lets you feel every bump as he laps at an average speed of 127.925mph. You will feel your stomach somersault as the rear of the Superbike goes light over the leaps and bounces just inches from the kerbs. The sound of the screaming 1000cc engine leaves you in no doubt about the ferocious power Amor is unleashing around the TT course. Next, TT legend John McGuinness carries a forward-facing camera on his HM Plant Honda Superbike as he sets the fastest TT lap recorded by an on-bike camera – so far. You will be awe-struck as the undoubted current King of the Mountain stuns the opposition with an average speed of 130.242mph – almost 9 seconds quicker than anyone else, despite being held-up! Kiwi Bruce Anstey takes the Relentless Suzuki by TAS Racing Superbike around at 127.915mph, with a forward-facing camera letting you appreciate Anstey’s stylish riding. He may be smooth, but don’t be fooled into thinking he’s slow – the speed the hedges and walls flash by, the way the camera lifts as he powers through the gears and the throaty roar of the 1000cc Suzuki give you every sensation of speed . Finally we join Anstey’s teammate Cameron Donald with a front-facing camera mounted on the Australian’s Relentless Suzuki by TAS Racing Superbike. It shows how the machine bucks and fights back against his aggressive style. He must be doing something right – he managed an average of 128.011mph from a standing start! Keith Amor carries a rear-facing camera on his HM Plant Honda for lap four of the PokerStars Superbike TT. We average 128.973mph and watch the incredible sight of Cameron Donald closing at speed and a 12-mile battle as the Australian hunts down his Scottish rival. We join Bruce Anstey on the Relentless Suzuki by TAS Racing machine for the first lap of the Superbike race lap of the year. The forward-facing camera shows Anstey has an almost clear track ahead, so there is nothing to distract us from the rider’s supreme skill as he handles the 1000cc Suzuki, battling with the machine’s shaking head as it descends Bray Hill and clatters over the bumps on the run to Ramsey during a 126.934mph opening lap. It is then over to Anstey’s teammate Donald on lap two of the Superbike TT, with a forward-facing camera showing you the lurid sides and wobbles through Glen Helen and the forks being forced to work all over the course at an average speed of 129.034mph. Finally, we join Klaus Klaffenbock on his way to a popular first TT win in the opening Sure Sidecar Race. The forward-facing camera is mounted just in front of seasoned passenger Daniel Sayle for this storming lap, where speeds hit up to 145mph in the 600cc LCR Honda outfit. At Sulby Klaffi joins a thrilling nose-to-tail battle with fellow world champion Tim Reeves which shows just how exciting the chairs are around the TT course. A rear-facing camera lets you feel every slide as rear tyre of Michael Dunlop’s Street Sweep/Robinson Concrete Superbike fights for grip under the power of the 1000cc Honda engine on lap four of the PokerStars Superbike TT. Lapping at 128.87mph, we see how Dunlop uses every inch of the road and the late braking into Creg-ny-Baa will leave you shaking – almost as much as the dice with Guy Martin between Glen Helen and Ballaugh! Ian Hutchinson dominated the 2010 TT, and a forward-facing camera records him averaging 128.759mph from a standing start on the first lap of the Royal London 360 Superstock race. His smooth style makes it look easy as he claws back 10 seconds on Ian Lougher by Ramsey, before drafting past and onto a jaw-dropping run over the Mountain. Next is Australian star Cameron Donald on the final lap of the Monster Energy Supersport race 1, with his 600cc Relentless Suzuki by TAS Racing machine at an average speed of more than 122mph. Battling to control the bike through Handley’s and Rhencullen, dealing with slower machines and yellow flags, hitting every bump from Sulby to Ramsey and dicing with Ian Lougher and Conor Cummins – it’s all here. Finally, we join Guy Martin on the Wilson Craig Honda for two laps of the Superstock TT. The forward-facing camera is so close to the walls and hedges at times you would swear the rider must be brushing the scenery. This is heart-in-the-mouth stuff as we join Martin at an average speed of more than 127mph.